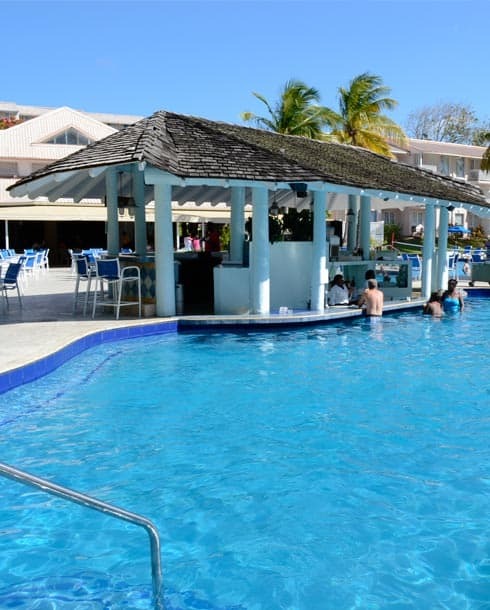 Your All-Inclusive vacation at St. James’s Club Morgan Bay includes all drinks by the glass, including alcoholic and non-alcoholic beverages. 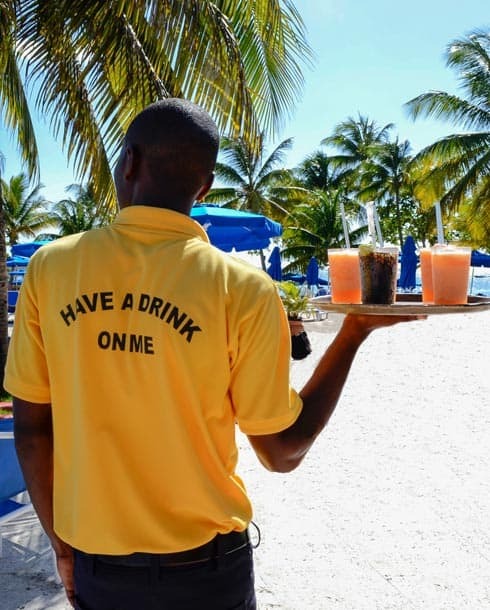 Our friendly bartenders and colorful ambiance make St. James’s Club Morgan Bay one of the Caribbean’s best and most cheerful beachfront resort destinations. So sit back, relax and enjoy one our acclaimed signature cocktails. 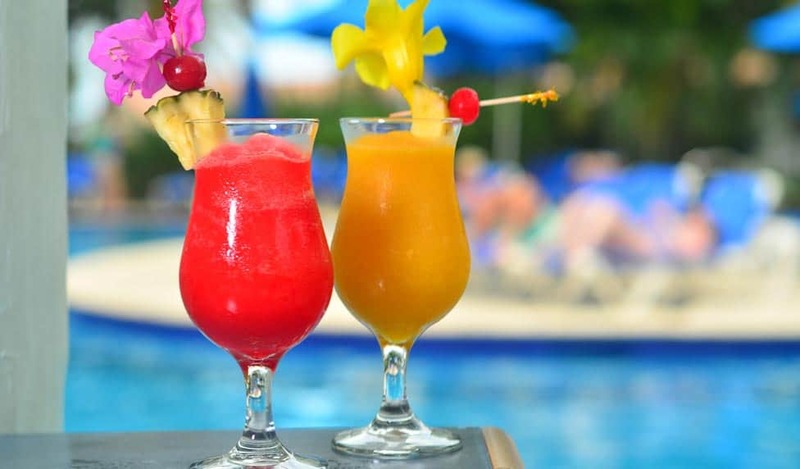 All of our distinctively Caribbean restaurants offer full bar service including beer, wine, cocktails, and blended drinks. A wide variety of liquors are available, in addition to terrific local St. Lucia and Caribbean-based beers, rums, and liqueurs. 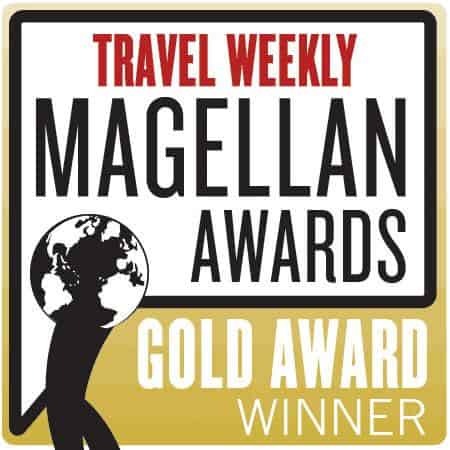 Our All-Inclusive meal plan includes all beverages by the glass, including both alcoholic and non-alcoholic selections. 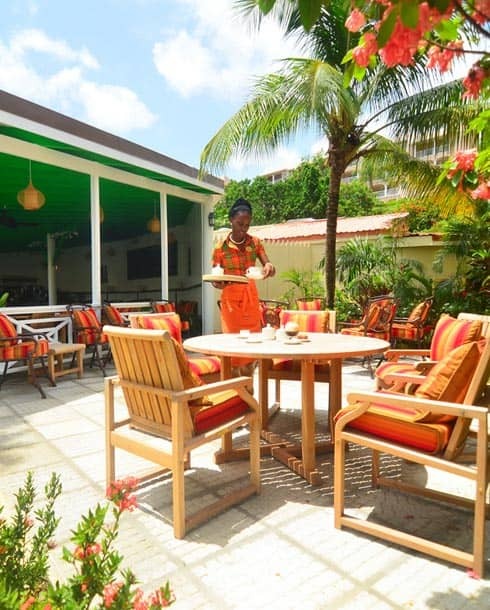 So pull up a sun lounger or swim-up to our shady pool bar and enjoy your favorite drink in style. Choc Bay Café serves specialty tea & coffee drinks and homemade pastries. The Sunset Lounge is the resort's main bar and entertainment center. 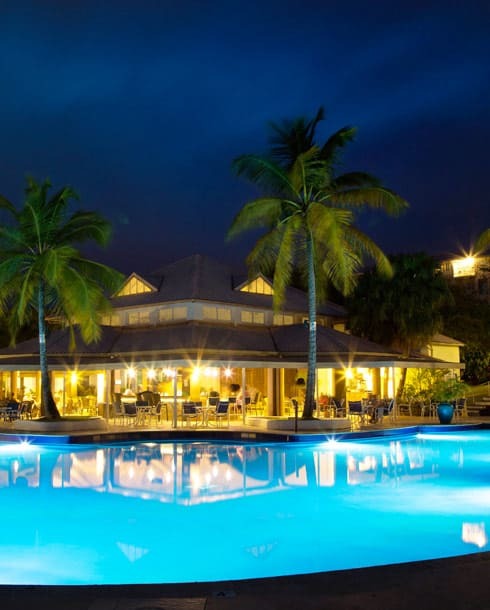 Our main pool bar with views of the beach and a swim-up side. The place for mom & dad to chill out while the kids splash and play at the family-style pool. Our quiet Adults-Only pool bar with dramatic ocean views. Located right on the beach, serving cool, refreshing cocktails during the day. The expanded specialty coffee shop is open daily from 6.30am to 12.30am. Serving Barista Coffees, Specialty teas, Cakes and Savory delights, we are no offering takeaway service as well as eat in service, in either the coffee shop or in the expanded seating in the garden by the new giant chess set. The resort’s main bar and entertainment center, the Sunset Bar & Lounge, keeps the rhythm of the Caribbean flowing with full bar service throughout the day and until 12:00am in the evening. Activities abound during the day, and live entertainment every evening, including local bands, vibrant dancers, limbo, DJs, and more. Step outside to the lively open-air pavilion where guests can mingle, laugh, and dance the night away, or simply relax at a poolside table for a candlelit cocktail. 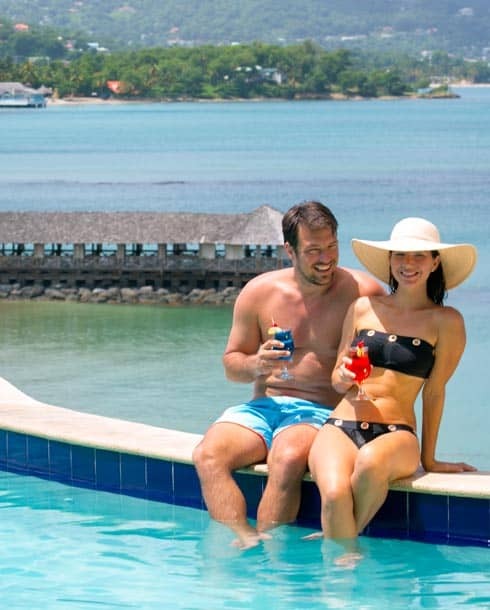 Overlooking the resort’s 2 free-form swimming pools and the beach, the Lazy Lagoon Pool Bar allows guests to enjoy a libation in the sun, with ice-cold beer, wine and full cocktail service. The best part is the popular Swim-Up pool bar side! Open daily from 10:00am to 6:00pm for ages 18 years and older. 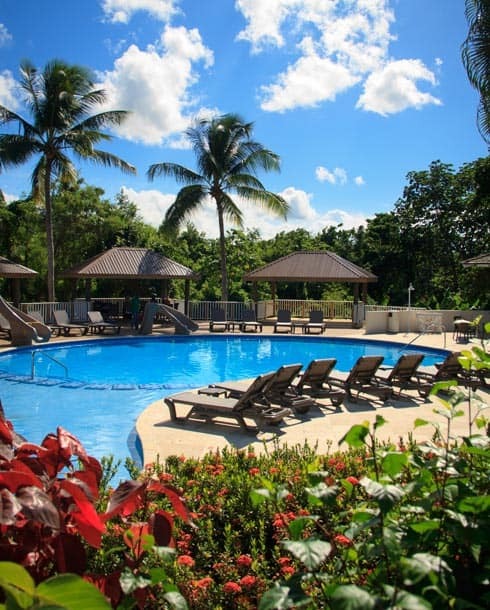 The place for mom and dad to chill out while the kids splash and play at the resort’s family-style pool, which includes two pool slides and shallow wading areas. Open every day, the Plum Tree Bar & Grill covers the spectrum of sodas, snacks, blended non-alcoholic drinks for kids and teens, and full bar service for adults. Open from 11:00am to 7:00pm. Glancing out over the resort with sweeping ocean views and dramatic sunsets, the Hilltop Pool Bar is the perfect hideout for a secluded cocktail in a quieter enclave setting. Open daily from 11:00am to 7:00pm and Adults-Only. Full service bar, right on the beach, either grab a seat with your feet in the sand or order from your beach lounger which will be served by our beach waiters and waitresses, full bar open daily from 10.00am to 6.00pm, yes you can even watch the sunset form this beech bar while your toes feel the warm sand of the Caribbean Beach.